The WW100 site was designed by Boost and built in collaboration with the Ministry of Culture and Heritage’s internal development team. 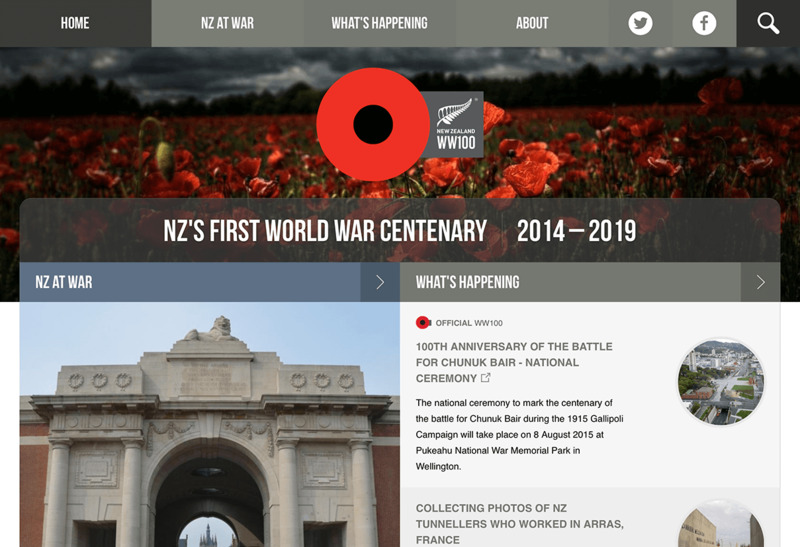 We provided design, user experience and Drupal development on three iterations over three years as the site’s purpose and strategic direction changed as the centenary of World War 1 drew closer. We designed the user experience and graphical elements of the ‘WW100 - 100 years ago today’ feature, presenting quotes from diaries, newspapers and letters dated 100 years ago today. The extracts are pulled from various sources and presented via twitter. We used the DigitalNZ API to search multiple content providers from around New Zealand for WW100 content. The ‘Find WW100 content’ section gives users the ability to filter search results by media type and copyright permissions. As the 2015 commemoration activities drew closer, the site required a change to focus on upcoming commemoration events. Using Eventfinder integration, we built an engaging events section. Users can find events by filtering content by category, region, location, year and recently added.